Peabody, Henry. 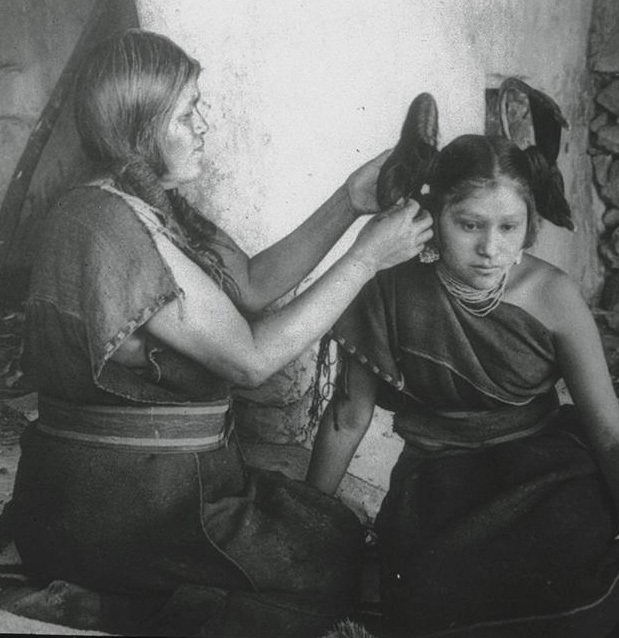 Hopi Woman Dressing Hair of Unmarried Girl, 1900. At the University of California, San Diego. Yes, this hairstyle is called the squash blossom whorl, and it is the traditional hairstyle for unmarried girls in the Hopi tribe. The Hopi are a Pueblo Native American tribe who have farmed land in what is now the state Arizona for many hundreds of years. The Hopi year is divided by two major events, the winter solstice and the summer solstice, and a complex series of minor events, including ceremonies and traditions with agricultural themes developed to promote healthy crops, fertile ground, and the most favorable growing conditions. Using their surroundings as inspiration, the Hopi people have creatively interpreted their need for rain, corn, and crops by imitating natural forms and cycles in dance, jewelry, pottery, and yes, hairstyles. The most complex element of these ceremonies and traditions is the role of the kachinas, which can most simply be defined as the guardians of the land and of the people. Curtis, Edward Sheriff. Hopi, Watching the Dancers, 1906. Gelatin silver print, 7 3/4 x 5 13/16 in. From The J. Paul Getty Trust. Found online. Additional images of the process of constructing the squash blossom whorl can be found at the Mathers Museum of World Cultures in Bloomington, Indiana. Please use the link provided to view a set of images from 1913. This week, we have remarked on some fantastic hairstyles inspired by the Hopi Squash Blossom. Bjork’s hairstyle on the cover of her album, Homogenic, and Princess Leia’s famous space age side buns. Hairstyles with cultural significance often find a renaissance in another culture. Traditional hair fashions with a special significance can inspire new interpretations totally devoid of meaning, or reinterpretations within new, different context. We think immediately of the mohawk, a modern symbol of rebellion which was borrowed from the Iroquois, who removed most of their hair in a rebellious gesture toward the scalping of their people. Other Native American hairstyles continue to inspire us: beautiful braids, the elegant topknot, the chongo, and crescent-shaped hair of the Seminole tribe. Like clothing and jewelry, tradition hairstyles were once a sign, an indicator of status or participation, and modern fashion continues to renew and recreate the meaning of these powerful symbols. 1. Mora, Joseph. 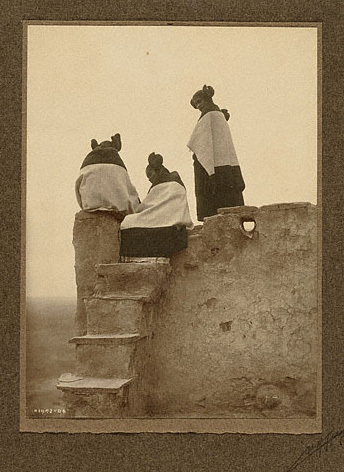 The Year of the Hopi: Painting and Photographs by Joseph Mora, 1904-06. New York: Rizzoli, 1982, c1979. This entry was posted in Mystery Mondays and tagged hopi, mystery monday. Bookmark the permalink. I was doing research for school and found this page! Love it! Pingback: FEATURE: THE HOPI TRADITIONAL ‘SQUASH BLOSSOM’ HAIRSTYLE « CULTUREPATTERN.COM .:. cut from the same cloth.